1. Sell the demo, not the product. 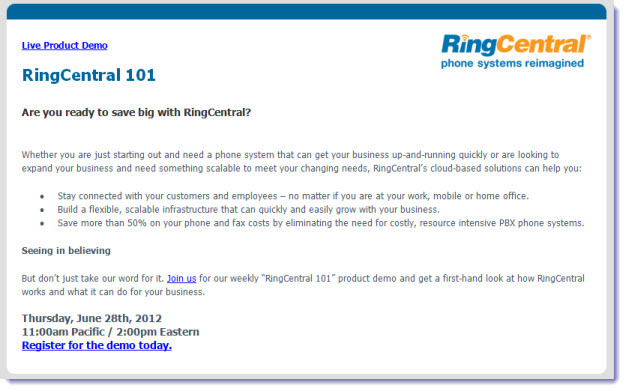 Take a look at the email below from RingCentral, a provider of VoIP (cloud-based) phone systems for small businesses. (Click on the image for an expanded view.) Nowhere in this invitation do I read what I’ll learn by attending the demo, how long the demo takes, what features/functionality I’ll see demonstrated, etc. Nothing, in other words, that might convince me that the demo is worth my valuable time. All I read is a series of boilerplate bullet points about what RingCentral can do for my business. Now, those benefits may be compelling and legitimate reasons to invest in a RingCentral phone system, but (critically) that’s not the decision I’m being asked to make here, so they’re immaterial. 2. Use graphics to make the offer more “real”. Normally I’m not a big proponent of using screen shots in email campaigns, but demo invitations might just be the exception. 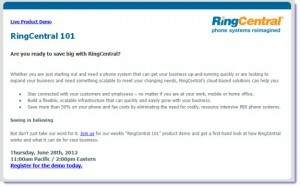 Note that the RingCentral invitation is devoid of any visual elements whatsoever (except the company logo) – not only does this make the email incredibly boring and even ordinary, but it misses an opportunity to underline the value of the demo by reinforcing what the attendee will see, hear, and learn. It’s not even critical that the screen shot tell a particularly compelling story – ANY screen shot communicates that the demo is a real, live Web event. Speaker photos accomplish the same goal – it matters less whether anyone has ever heard of your product manager before; just showing his/her face makes the demo more tangible, and thus a more attractive offer. 3. Treat the demo like an event. When companies market Webinars, it’s natural to want to offer up a brief agenda, a speaker bio, details of what the attendee will see, hear and learn at the event. Why should a demo be any different? After all, a demo is just a Webinar minus the window-dressing. Ask yourself: what will a prospect learn by attending? What specific features, functionality, and capabilities will he/she hear described, and how will those features benefit his/her business? Note that by selling the demo as an event, you can still communicate the underlying value of your solution – it’s just that you’re doing so in the context of the offer. As with Webinar invitations, the goal of your campaign is to get the reader to register for the event, nothing more. Focus your copy on convincing the reader why the demo is an investment in time worth making. This entry was posted in B2B Marketing, E-mail, email design, email marketing, Event Promotion, Lead Nurturing, Offer Strategy and tagged b2b demand generation, B2B Marketing, email design, email marketing, marketo, Marketo agency, Marketo partner, marketo tips, ringcentral on September 24, 2012 by Howard Sewell. Howard – what are your thoughts of a short 10-15 demo as part of a webcast? Thanks Howard. As always very useful information.